Knitting, sewing, and photography keep me sane. I have a design published in a book! 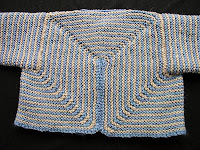 It is in Circular Knitting Redefined, a baby sweater named Sweetie Pie Stripes. It was knit last April from The Fibre Company Canopy Worsted in 2 colors. I knit the sweater 3 times before I submitted it. I scanned the little boy image out of the book. The back is really interesting. It isn't shown in the book. Ravelry starts for this month. I joined a new group last month, called Project Yarnway. It's similar to Project Runway in that you have a challenge to do in a short period of time. The challenges are monthly and unknown until the month starts. The February project was to use stash yarn. My Oh My! Moguls! socks qualified. The March challenge is called Innovation. The project can only have a maximum of 20% yarn in it. The rest must be materials not sold for knitting or crochet. My project uses olive green rayon seam binding and black tape used for hanger loops in the shoulders of garments. I have lots of each; 100 yds of seam binding ?00 yds of black tape, the number is illegible. The project will be a scarf. The knitting is hard work because of inelastisity of "yarn". I don't know how long I will make it. SKA Mystery sock for March Clue 1. The cotton yarn and twisted stitches make the pattern really pop. I have started the second sock. This yarn and pattern were bought in 2003 on a trip to the west coast to see my sister. It finally matched with a challenge. The pattern is Reflections socks from Fiber Trends. The interesting aspect of the pattern is the patterning only on the back. The front is 1x1 ribbing. The foot is stockinette. 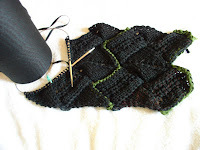 If I have nothing else to do, I have a sweater to knit by April 2. I had hoped to knit it by machine, but the yarn wouldn't cooperate. Luckily it is short sleeved in worsted weight yarn. I still will have to write a machine knit pattern, but will illustrate any techniques with a machine tested yarn. Plymouth Yarn Co. has 2 new sock yarns. 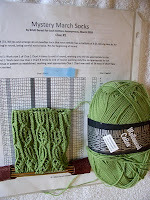 I am working on swatches for new socks for them. I've been designing 2-color socks from their solid yarn recently. It will be a while before I can show them off. I did find one pair of my socks on their website recently. They were designed for a man. I'm a professional dressmaker, who is also a knitwear designer. I'm a TKGA Master Knitter. I have a husband, 6 children, with assorted spouses and fiances, 10 grandchildren and 3 great grands. I've been knitting and sewing forever.